The "Tokyo Triumph" has stopped in the waters of the Lacadive Sea due to engine repairs in position 13-2 3N 057-54 E on Apr 14, 2018. The ship has no AST but was safe. After repairs the ship has resumed the voyage from Rotterdam to Colombo, ETA Apr 18. Officers of the water police found several defiencies regarding marine regulations during an inspection aboard the "Tokyo Triumph" after the ship docked in Hamburg on Jan 9, 2018. The vessel was sailing in charter of Evergreen. For the alleged offenses administrative offenses were instituted against the captain, the first officer and the chief engineer and a fine of 21,843 Euros had to be paid. The chief engineer had apparently not switched from high to low sulfur fuel for the auxiliary diesel in the North Sea. This resulted in the illegal burning of the prohibited fuel. In addition, the 56-year-old Indian national had entered incorrect information on the changeover time in the prescribed documentation. At the Burchard Quay in the Waltershof port the officials also found that, despite open outboard valves, the ship's effluents were not chlorinated as prescribed in the on-board wastewater treatment plant. 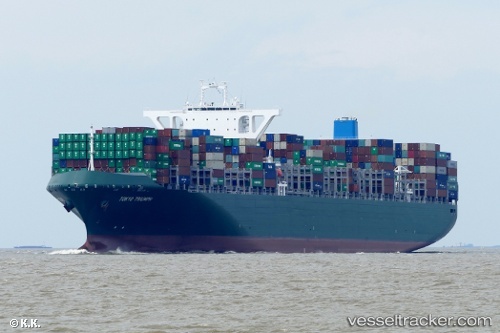 The first officer, also an Indian, had already pumped untreated ballast water into the port of Hamburg in November 2017. In addition, the control group complained that the ballast water-, oil- and refuse diaries were not kept in accordance with the regulations. The ship left Hamburg again on Jan 11, next bound to Rotterdam.